Did you just get braces? If so, your teeth and mouth might be a little sore for a few days. It might be difficult to bite into and chew the type of food you usually eat. But don’t worry. Within a short period of time the tenderness will subside, and you’ll feel normal again. Don’t Let Food Damage Your Braces! Once you get used to your new braces, don’t automatically return to your pre-braces diet. But it’s important to understand that certain types of food can get stuck in between your brackets and wires, making it difficult to clean your teeth. Hard, sticky, and crunchy food items can damage your braces and can even cause a bracket to pop off or a wire to break! It’s not necessarily difficult to identify specific foods to avoid. In general, foods that are challenging to bite and chew can cause problems. Even though it requires a bit more thought and planning, following a recommended “braces diet” should help prevent avoidable problems. Hard Foods: Examples of hard food items include: popcorn, nuts, hard bread, raw and hard fruits and veggies (that are not cut into smaller pieces), hard pretzels and chips, and corn of the cob. You should also avoid chewing on hard items such as ice and hard candy. Sticky & Chewy Food: Caramels, gum, licorice, toffee, fruit snacks, and similar types of food and candy can cause bands, brackets, and wires to bend or fall off. 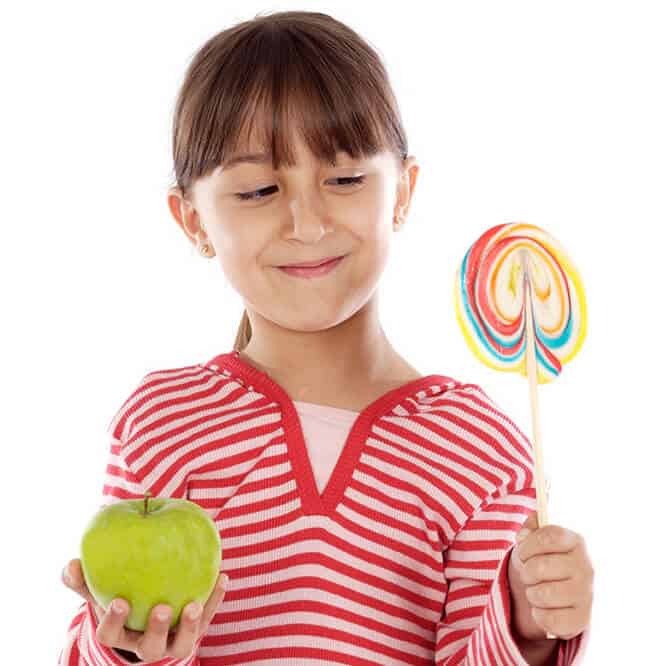 If you must eat sweets, choose something that won’t stick to your braces. Good examples are soft chocolate or ice cream. Large Food: Putting a large food item or too much food into your mouth all at once can cause problems with your braces – even if the food is relatively soft. It’s advisable to take small bites of food to decrease your risk of damaging your braces. Chewing food with your back teeth can help keep your front brackets from breaking loose. Hard Items (Not Food-Related): It can be difficult to break a habit. If you regularly bite your fingernails, chew on a pen or pencil, or open packages with your teeth, now is a good time to stop. Biting or chewing on hard, non-food items can cause damage. So… What CAN I Eat? Hopefully eliminating hard, sticky, and chewy foods from your diet during your orthodontic treatment won’t make you feel discouraged. There are plenty of foods that are perfectly acceptable to eat while you’re wearing braces. After a few weeks in braces, you’ll get used to making optimal choices, such as: soft fruit, cooked veggies, eggs, dairy products including yogurt and cheese, and soft bread. If you have any questions about what types of food you should avoid and what types of food are acceptable, please ask! We hope you won’t feel deprived of delicious food during your orthodontic treatment. We want you to enjoy the process of achieving straight teeth and a healthy smile!